7 years 5 months ago. You're the best! http://prod1.cmj.com/articles/display_article.php?id=188548240 8 years 8 months ago. Good Luck and so sorry I was not able to make it... TERRY 8 years 11 months ago. The beautiful "BIG FAT GRIN" looks like Brayden! Congrats on the upcoming release.. 8 years 11 months ago. That beutiful "BIG FAT GRIN" looks like Brayden! Congrats on your upcoming release! 8 years 11 months ago. Composer/guitarist Jamie Begian shows that serious music can be serious fun too with this big band’s 2nd release titled Big Fat Grin. The music is witty, driving and full of all the unexpected twists and turns that are the hallmark of Jamie’s writing. The ensemble can go toe-to-toe with the best of ‘em; displaying warmth and grace on the ballad Suddenly, Summer Falls while laying into a power funk groove on Patience. Trombone fans will be intrigued by the four-part Taylorations Suite, loosely based on a warm-up exercise by legendary trombonist Dave Taylor, while “jazzy jazz” fans will appreciate the boogaloo beat on Funky Coffee and the up tempo Big Fat Grin. Jamie also reaches into his Armenian roots for the catchy clarinet feature on Halay. Basically, Big Fat Grin will make you feel as good as if you all of a sudden found out that Cap’n Crunch was a health food! Jamie Began composing in the early 90’s and was a long-time member of the BMI Jazz Composer's Workshop, headed by Jim McNeely and Manny Albam, in New York City. He has also studied composition privately with Bob Brookmeyer and was given great guidance by his guitar teachers Rodney Jones and Sal Salvador. The Jamie begian Big Band was formed in 1998, made its concert debut in 1999 and released its first CD “Trance” in 2003. John O’Gallagher, Marc McDonald, Ben Kono, Dimitri Moderbacher, Dan Goble (reeds) Tom Goehring, Dave Scott, Marty Bound, Jason Colby (trumpets and flugelhorns) Jeff Bush, Deborah Weisz, Paul Olenick, Max Seigel (trombones) Bruce Arnold, Jamie Begian (guitars) Dave Ambrosio (bass) Peter Retzlaff (drums). Who wants to take on the task of turning 17 individual musicians into a jazz big band? Very few people would attempt it, and fewer would succeed. 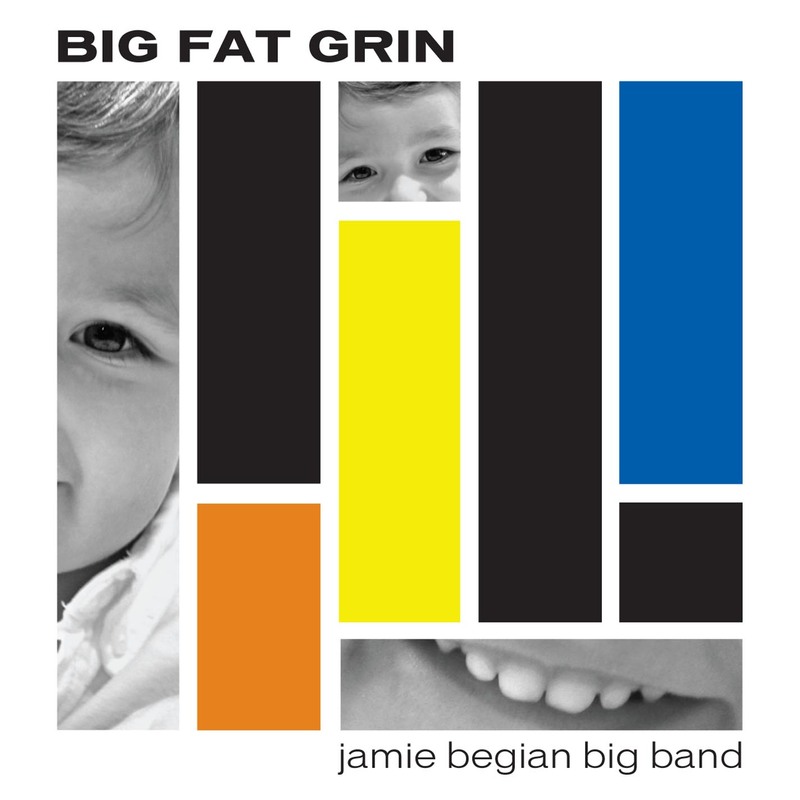 Guitarist Jamie Begian did it in 1998 and the Jamie Begian Big Band now celebrates its 12th year with the release of its second album, Big Fat Grin. Begian not only leads the band, he wrote and arranged the tunes, and produced the album. That's a lot of responsibility, but the success of this album will surely make it feel worthwhile. "Funky Coffee" opens the album, its initial phrases bearing a passing resemblance to the theme tune from the original film version of Casino Royale (1967). It certainly is funky, but in a refined, smooth fashion that makes the most of the horn section's silky ensemble playing, and the bass and drums of Dave Ambrosio and Peter Retzlaff. As with all of the tunes, Begian builds in space for two or three solos and the players—Marc McDonald on alto, Tom Goehring on trumpet and Deborah Weisz on trombone, in this case—always use that space to excellent effect. Two contrasting tunes show the range of Begian's writing and arranging talents. "Halay" displays elements of East European folk, hints of Duke Ellington and even the humor of Raymond Scott's idiosyncratic compositions. Dimitri Moderbacher's clarinet takes a central role on this driving and swinging tune. The lovely "Suddenly, Summer Falls" is a more serious piece; its beautiful melody is laidback and controlled but still emotive, and once again the solos—from Begian, Moderbacher on flute, and flugelhornist Jason Colby—are crucial to the tune's success. ...Big Fat Grin shows just how a talented big band can create affecting music. As a player, Begian is a key member of the group but he stays predominantly in the background. His strength as a leader lies not only in his writing and arranging but in his ability to identify and use his band members' strengths to their greatest effect-. It's a rare ability, and one which helps to make Big Fat Grin such a successful example of a big band at work. This youngish guitar man has been a sidekick of Manny Albam, Bob Brookmeyer and Sal Salvador so you really don’t have to question his big band credentials. Sounding like the classic big bands when they were at their most golden left leaning, this crew doesn’t play it straight but they do fire fast balls right down the middle. With a lot of moves that sound like they could have been a tribute to 70s Carla Bley, progressive ears have a welcome find here. Ahhh...another fine big band CD. Composer-guitarist Begian, currently the director of the Jazz Studies Degree Program at Western Connecticut State University (he's been on the faculty since 1991), had the good fortune to be involved with the BMI Jazz Composers Workshop, studying under the tutelage of Jim McNeely and Manny Albam. He wrote his first arrangement for big band whie working there and soon began organizing the 17-piece group he has led since 1998. As a composer, Begian displays such diverse influences as the Count Basie Orchestra, Jimi Hendrix, Chicago Blues, Philip Glass and Gil Evans. This new release has works that swing with a bluesy lilt (the opening "Funky Coffee"), have classical beauty ("Suddenly, Summer Falls") and literally "rock out" with nervous joy ("Patience"). The 25 minute, 4-part, "Taylorations" is based on exercises developed by bass trombonist Dave Taylor - Begian creates a piece for each member of his 'bone section. They range from the bouncy then introspective then fiery "One" (featuring Jeff Bush) to the more classical sounding "Two" (Paul Olenick's feature) to the sound "sculpture" that transforms into a bluesy romp titled "Three" (featuring Deborah Weisz) to the swinging, Thad Jones-like, "Four" (featuring the bass trombone of Max Siegel.) Kudos go to the interactive rhythm section of guitarist Bruce Arnold (Begian also adds his guitar "voice" throughout the program but especially on the title track when he trades phrases with Arnold), bassist Dave Ambrosio and drummer Peter Retzlaff. 5 reeds and 4 trumpets round out the lineup and they all play well. A "Big Fat Grin" is what should break out when one spends time with this fine CD. Due to the expenses of keeping a 17-piece band together and his teaching responsibilities, Jamie Begian does not get to play this music all that often. Here's hoping more people get the opportunity to hear this excellent recording and that gives the band the opportunity to play some gigs. If the music on Jamie Begian's Big Fat Grin were any bigger and fatter, the grin would challenge that of Lewis Carroll's Cheshire cat from Alice in Wonderland—charming, mischievous and truly iconic. Indeed it embodies ... Carroll's creation and thus the music becomes a remarkable allegorical tale, one that is richly described in the title track through solos that unravel like dense whorls from the exact report of the downbeat. The rapid cyclical thrust of each solo—on guitar, bass and tenor saxophone—creates a spectacularly playful image and then, remarkably, when the ensemble returns, the whole theme inverts itself until the sound fades like the disappearing body of the cat in the tale. The southern swagger of "Funky Coffee" is driven by a delightful cacophony of brass and winds and an almost drunken rhythm section. "Halay" dances like a team of dervishes and kicks up a storm that thundering and shimmering at the speedy and electrifying hands of drummer Peter Retzlaff before returning to its ululating Turkish theme. Begian's charts are sleek and shiny, somewhat carved from dark walnut or cherry wood, and showing rounded, contemporary corners that blend, ebb, and flow, completely pleasing to the ears ... The sophistication and high-class values that Begian holds dear manifest in layers of sound from the 17-piece ensemble on the delightful "Funky Coffee," reminiscent of predecessors like Bob Mintzer or the Brecker Brothers' collaborations with the German WDR Big Band. But then the game changes, with a klezmer-funk "Halay" retaining the excellent symmetry of the band ... As the Innova label specializes in 21st century contemporary music removed from jazz, this is a nice addition to their catalog, and should be embraced by those who understand that the big band is far from dead. Big Fat Grin ... dreams on an enormous scale. Begian, the composer and guitarist, thrills with full, lush writing that embodies the view that art doesn't die. Music doesn't just stop. Putting pen to paper and thought to words and passion to sound will always exist as long as we have breath in our very lungs ... Joy is all over Big Fat Grin. The cornerstone of Begian's writing, and indeed the performance of the entire big band, is that of happiness and passion. Genre trappings and musical "eras" be damned, this is deliciously thick jazz well worth smiling about. "This album is very interesting in many aspects for a big band and I think that Jamie is on his way to continue what Toshiko Akyioshi did in her time to find her own voice. This is great!" Totally modish and avant-angled, Big Fat Grin from Jamie Begian Big Band invokes the spirit of spontaneity with the graceful swagger of complementing riffs anchored by a driving rhythmic pulse. The band’s instruments project physical movements like the Arabian swirls of “Halay” mirroring a belly dancer’s gyrations, and the boogaloo inspired twits and propelling vaunts of “Funky Coffee” mimicking a fun-filled jamboree. The winding twirls of the horns in “Suddenly Summer Falls” have a rusticated aroma contrasting their bold punctuations fanned along the four movements of “Tayloration 1-4” making for swift cuts of racing flusters offset by the lounging calmness of the coasting furls of the trombone. The title track is a stimulating piece with instruments interacting with each other alternating between crisscrossing patterns and converging passages into one another. Instruments engage one another, tangling and disentangling, prodding each other forward and withdrawing to produce stirring currents that keep the mechanism operating the tracks in a state of fluctuation. 5/5 stars: "Begian’s compositional style is kernel development. He starts with a simple idea, often a rhythmic element then constantly expands and layers it, throwing in unexpected twists and turns that always surprise and delight ... Unusual, interesting and also funky as the name suggests, 'Halay' is based on an Armenian dance rhythm and a snippet of melody which grows into a foot-tapping rollick. This is as fine a collection of original modern jazz compositions as one could expect to find, performed flawlessly by a tight group of talented players. The listener can expect the unexpected, a solo on top of a solo, an electric guitar slide, a sudden blast of horns, the unanticipated harmony or an abrupt change of meter or tempo. It’s what keeps you wearing a big fat grin."